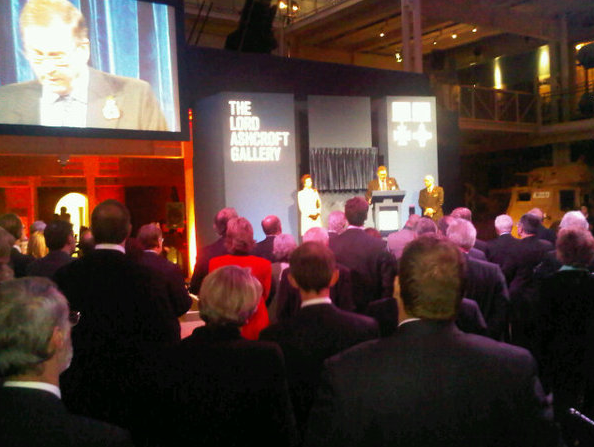 I spent a very pleasant evening at the Imperial War Museum to mark the opening of the new Lord Ashcroft gallery, which contains more than 260 Victoria and George Crosses. It really is a truly amazing collection and opens for public view tomorrow. Michael made a very moving speech about what inspired him to start his collection and then spoke the about courage, valour and gallantry displayed by those who have been awarded VCs and GCs. Michael Ashcroft's new book, out next week can be ordered HERE. And do go to the IWM to see the Ashcroft Gallery. But take some tissues. Some bits can make you very emotional. A funny thing happened on the way back. We got into a cab and the cab driver said, "You're on the radio aren't you, I recognise your voice. Don't tell me, don't tell me ... you're that Anthony Davis on LBC aren't you?" "Right station, wrong presenter,"I replied. "I definitely know your voice. I know. You're Nick Abbott." "Nope." "Clive Bull?" I then put him out of his misery. "Oh, I like you, you're alright!" Alright??? Is that all? Lol. On the way home I listened to Mehdi Hasan doing my show. A very odd experience. It's only the second time I have had a night off in two months and I really missed my show. I guess that's good. The question is, did my audience miss me?! I'll be back on tomorrow night. Dr Johnson springs to mind for some reason. What's the Point of Rampaging Through London? What Fact Did Lord Young Get Wrong? Is There a Future for Books? A Test for Labour or the Coalition?